Naturally enough being a country house we are located in the country side, a little off the beaten track in Kilkenny's rich farm lands. Ryeland House Cookery School is located a short drive outside the historic city of Kilkenny. 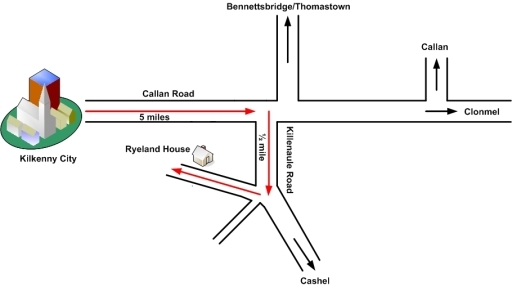 You can use the map shown below to help you reach our location or you can use the excellent AA route finder service. We are always more than happy to give our guests directions, so don't hesitate to call us at any of the numbers listed on our contact page.